Building a new pool in your yard is a big investment — your pool will be the key feature of your property, around which you will plan the rest of your outdoor space. Once you realize the impact that your new pool will have on your home, family and landscaping, you will quickly find that some design features can be essential elements of your pool installation. Think about who will use the pool, how you will use the pool and where the pool will be located in relation to the other features of your property. These starting points will establish the purpose of your pool and help you plan the proper design. The Association of Pool and Spa Professionals reports that there were almost 8,600,000 private swimming pools in the United States in 2013. The large market for swimming pools in the U.S. provides a sufficiently large customer base to enable equipment providers to invest in innovations. There are always new developments in swimming pool technology in the pipeline, and new products drive changing consumer trends. In this post, we have organized a rundown of the various construction and design elements of pool installation. 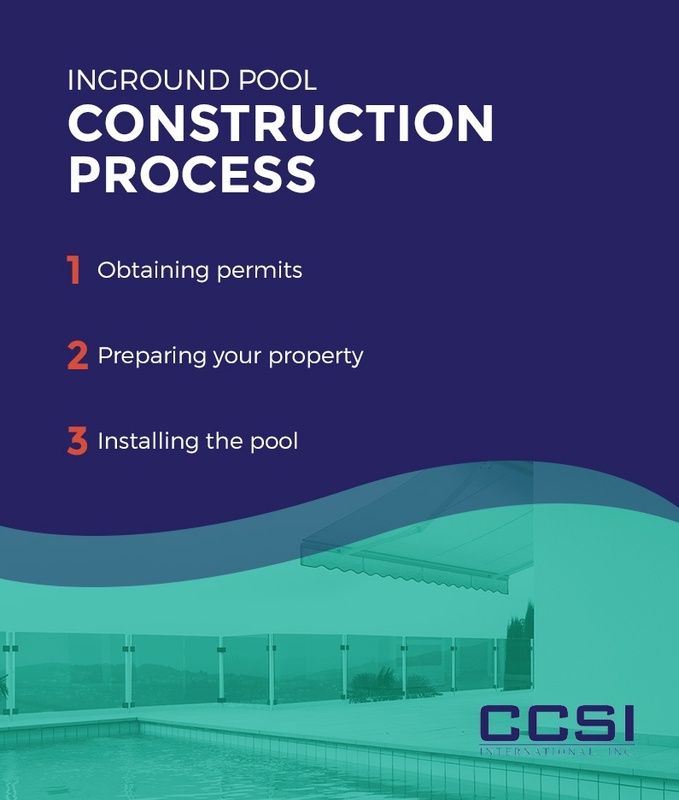 Take a look at the following pool installation considerations, and use it as a guide for constructing your own inground pool. One of the first things you must know before buying an inground pool is the material. Different materials have different benefits and disadvantages — knowing your pool’s capabilities on the front end will influence later decisions like the shape and design of your pool. Three primary materials are used to build inground swimming pools — fiberglass, concrete and vinyl liners. Below, we explore the qualities of each material so you can find a type of pool that fits the needs of your yard and budget. Low maintenance: Unlike plaster, fiberglass pool shells don’t have large pores or cavities. This decreases any algae growth, and it lowers the overall amount of chemicals you need to sanitize your pool. Non-abrasive surface: Because of its gel coat surface, fiberglass pools are smooth to the touch. This makes it a perfect choice for families with small children who could get scratched by rougher materials. Easy installation: Typically, fiberglass pools only take three to six weeks to finish — since they are constructed off-site, they require less time for on-site installation. Built-in steps and seating: Many fiberglass shells have seating and steps built into the design, reducing the extra elements you will have to add to your pool. Manufactured in a controlled environment:Unlike cement pools or vinyl liners, fiberglass shells are manufactured in a controlled factory environment. This gives companies complete control over the climate and conditions surrounding the manufacturing of fiberglass pool shells. Aesthetically pleasing: It’s easy to make a fiberglass pool beautiful. Line the shell with ceramic tiles for classic appeal, or apply colored finishes, tanning ledges, pool lights and water features for chic final touches. Although fiberglass pools have a long list of benefits, they come with a few disadvantages. Fiberglass shells have limited shapes and designs — they aren’t as customizable as materials like concrete. Because fiberglass shells are transported by trucks, shipping restrictions limit fiberglass pools to approximately 16 feet wide and 40 feet long. Fiberglass pools also cost more on the front end than vinyl liners — although fiberglass pools don’t require as much upkeep as vinyl liners, the initial cost may discourage some homeowners. Customizable: One of the major appeals of concrete is its versatility. You can design a concrete pool to fit any shape, size and depth that you want — concrete is a good choice if your pool has unusual size or shape requirements. Flexible design features: Like fiberglass shells, concrete pools can be designed with a variety of extra features including beach entries, vanishing edges and tanning ledges. Artistic appeal: Because concrete pools are so flexible, you can integrate them into any type of architectural and landscape design. This gives you ultimate artistic flexibility when you are upgrading your yard. Concrete is a flexible and customizable material. However, it comes with some expensive downsides. Concrete pools typically need renovations every 10 to 15 years, which often include re-tiling and resurfacing the pool. Unlike fiberglass shells, concrete pools also require more maintenance and a higher amount of chemicals to keep them in the best shape. Additionally, because concrete pools are installed on-site, they take longer to finish other models. Customizable: Like concrete pools, vinyl liners are completely customizable. You can design a vinyl pool to whatever depth, width and length that you need. Non-abrasive surface: Vinyl liners have a smooth surface, similar to fiberglass shells, making them an attractive choice for families. Low initial cost: One of the primary benefits of vinyl liners is their affordable price — initially, vinyl liner pools cost lower than both fiberglass or concrete pools. Resistant to algae:The vinyl material used in vinyl pools is relatively non-porous, which makes it resistant to algae growth. This reduces the amount of chemicals you need to maintain your pool. While vinyl liners are versatile and initially affordable, they also come with several disadvantages. Vinyl liners don’t have a long life — they typically last between five and nine years before needing to be replaced. A liner is also thin, between 20 and 30 mils thick — the thickness of a few sheets of paper. This makes them vulnerable to many types of damage, such as tearing from fallen tree limbs or sharp pool toys. Pricing is one of the most important factors to consider before building a pool. Although the final cost of your inground pool will depend on a variety of factors, we have included the general pricing for fiberglass, concrete and vinyl pools, along with extra costs that often come along with pool installation. For most projects, a fiberglass inground pool will cost anywhere from $20,000 to $70,000. The exact price varies according to multiple factors, including the size and shape of the pool, fees for county or city permits and tree removal during site prep. On average, the cost of installing a fiberglass pool is $5.50 per square foot. Typically, concrete pools are the most expensive type of inground swimming pool. Depending on the shape and size of your design, a concrete inground pool could cost anywhere between $30,000 and $90,000. Concrete pools also require regular maintenance, which adds to the final cost of the project. Vinyl liner pools cost less than both fiberglass and concrete designs. If you install a vinyl liner pool yourself, the final price tag could be around $15,000. However, if you hire a professional, the cost could go up to anywhere from $27,000 to $47,000. Vinyl pools require additional maintenance costs, although not as much as concrete pools. Fencing: Many homeowners choose to install a fence around their pool. A fence gives you some privacy and can serve as a windbreak to keep debris from blowing into your pool. Additional concrete: As you install your indoor pool, you may want to design walkways or other concrete elements around it. Dirt hauling: When you build an inground pool in your yard, you have to remove large quantities of dirt. To make sure this dirt is hauled off your property, you will need to hire a company to take care of the excess soil. As you decide what type of pool is best for your yard, take time to consider the size and shape of your pool. Select the size and design that makes the most sense for your property and landscaping. Below, we’ve grouped suggestions on how to determine the perfect size and shape for a pool for your yard. The size of your pool affects many other elements, including the appearance of your yard and what activities can be enjoyed in the pool. To decide what size is best for your outdoor space, first determine how you want the pool to be used. Will people go to your pool for relaxation and recreation, or will they use it for exercise and training? Considering the use of your pool is the first step in finding a size that is right for your yard — pools intended for swimming laps are typically much longer than recreational pools. The next consideration is what else will fill your yard or outdoor space — for example, are you planning to set up a spa or hot tub near your pool? Are you hoping to build an outdoor patio or deck in the near future? Design your pool with expansions in mind, and make sure you leave enough space for future projects. The last element to think about is how many people will use your pool, and how old they will be. If you have small kids now, you might feel tempted to design a pool with small children in mind. However, your kids will grow quickly, and they may want to invite their teenage friends over to swim in their pool in a few years. To get the most longevity out of your pool, plan a pool that can accommodate different ages as well as different group sizes. Once you’ve built your pool, you can’t change its size — base the size of your pool on your current as well as future needs. Once you know the size of your pool, the next element to consider is the specific design and shape of your pool. The design of your pool largely depends on your personal preference. You might feel drawn to pools with curving, flowing edges, or you could enjoy linear designs. As you design your pool, consider the size and natural shapes of your yard. If your backyard is filled with straight sidewalks and parallel fences, a straight-lined pool might fit best with the current look of your yard. Also, consider what features you want to include in your pool and yard design. Some elements work better with straight lines than curved ones — if you are set on a tanning ledge, infinity edge or a swim lane, a linear pool will probably work the best. Alternately, if you are looking for plenty of bench seating or a distinct, aesthetic appeal, a curved pool might be the design you’ve been looking for. When you are installing an inground pool, take time to consider the construction processes and timeframes associated with each type of pool. Below, we’ve listed the average construction times for fiberglass, concrete and vinyl inground pools. However, keep in mind that the exact time it takes to finish your inground pool depends on your unique situation — for example, the weather will have a significant impact on the installation of concrete pools. Fiberglass: Of the three common types of inground pools, fiberglass shells take the least amount of time to install. Although the timeframe and construction process will depend on the company you choose, many fiberglass shells only require three to six weeks to finish. After the pool is installed, you only have to wait two days before you can enjoy your new water feature. Concrete: Compared to fiberglass and vinyl liners, concrete pools take the longest to install — concrete has to cure fully before construction can be finished. In perfect weather, concrete needs a minimum of 28 days to cure. However, if the weather is less than ideal, a concrete pool can take anywhere from three to six months to complete. Vinyl liners: Vinyl pools don’t take as long as concrete to finish and can take even less time than fiberglass to install. Depending on the weather, the size and design of your pool and whether you decide to hire a company or install it yourself, a vinyl liner pool can take between one to three weeks to finish. Generally, the construction process involves three steps — obtaining permits, preparing the land and installing the pool. Obtaining permits: Before you can begin construction on your pool, you have to pull and obtain the right permits. These permits vary based on where you live and the type of pool you’re installing — contact your local government to make sure you have the right forms. Preparing your property: The next step is to prepare your land for building a pool. Typically, this involves excavating the pool site and performing rough grading for the patio, pool and landscaping areas. Installing the pool: After you have prepped your land, you are ready to begin installing your pool. In most projects, the plumbing and framing are installed first, followed by pouring a concrete shell or base. Next, any masonry, tiling and coping are completed, and once these elements cure, pumps and filtration systems are brought in and installed. Finally, the pool plaster is applied and set, and you can fill your pool with water. Although the exact construction process of your pool will depend on the size, type and design of the pool, most projects will follow these broad steps. Ask your pool builder for details before you start building a pool. Once you know the type, size, shape and construction process of your pool, you’re ready to move onto the additional features of pool installation. One of the most overlooked factors in pool design is climate control. Planning the perfect position for your pool requires information about the movement of the sun during the year. The most obvious location for the pool is close to the back of your house, with a terrace stretching from your living room to the pool. However, if the building casts a shadow year-round in that location, you may have to rethink your design so that at least part of your pool catches sunlight during part of the day. Shade from the midday sun is a priority if you expect your kids to spend most of the day in the pool, but you’ll need part of the terrace to have direct sunlight for most of the day if your family includes sun lovers. Poolside readers would appreciate a shady location to prevent them from getting blinded from sunlightreflecting off the pages of their novels. Similarly, outdoor computer users won’t see a thing on the screens of their laptops in direct sunlight. If possible, plan your pool’s location so that it has parts that are almost always in sunlight and parts that are almost always in the shade. You should also have sunny and shady terrace areas. Note the movement of the sun during the day. Observe how your building casts a shadow at different times of a day — the shady areas will not be the same all day as the sun moves across the sky from sunrise to sunset. Bear in mind that the height of the sun’s track across the sky varies between summer months and winter months. The shadows cast by your property’s building and trees will fall in different directions at different times of the day. Permanently exposed areas are easier to adapt than permanently shaded locations. You can provide shade with awnings and parasols. However, you can’t provide artificial sunlight in locations where the sun is blocked out. Even in warm locations, the water in your pool can remain cold for most of the year. It takes time for the sun to heat up such a large body of water naturally, so getting into your pool without the shock of cold water requires water heating. The managers of public indoor pools always aim to balance the water temperature with the ambient temperature of the hall the pool is contained in. Because pool users have become accustomed to heated water, this convention made water heating common in indoor pools and necessary in outdoor pools. Reflected heat from the walls and floors of swimming pools offers one method of enhancing the heating properties of the sun. Unfortunately, the heat absorption of pool sides can only be improved by painting them black. Human aesthetics find black swimming pools unappealing, and so the color method of increasing pool heat naturally is rarely used. The Department of Energy reports that gas swimming pool heaters are the most widely used water heating systems for U.S. swimming pools. However, the complexity of installing and maintaining these systems and the cost of gas supplies have driven innovators to find alternative heating methods for pools. Heat pumps cost less to run and operate off electricity, which is easier to run out to the pool site than a gas line. Environmentally-friendly pool owners want to cut their carbon footprint, and so the trend towards alternative water heating methods is growing. Solar heating systems pull water from the back of the pool filter and push it through solar panels, where it gets heated by the warmth of the sun. The panels are usually located on the roof of a nearby building. Water leaving the panels gets piped back into the pool. Solar heating systems are cheaper to run than gas or heat pump systems. However, they aren’t no-cost systems because the pumps that circulate the water up to the solar panels and back to the pool must be driven by electricity. The Department of Energy estimates that the lower running costs of solar panels for swimming pool heating will pay back their purchase and installation cost between one and a half to seven years. If you have a tall building and a small plot your backyard may be overshadowed by your home. In a high-density neighborhood, you may not be able to avoid permanent shade cast by other properties over your backyard. In these instances, consider installing your pool in the front yard or on the side of your property. You can screen the front yard with high fencing to keep out the prying eyes of passers-by. An enclosed front yard with an eye-catching pool provides an unexpected visual feature to arriving visitors. By building your pool at the front of your home, you can integrate a front pathway into the pool’s design. A pool in the shape of a figure eight­ can be easily crossed by a humped-back pedestrian bridge, or a long, narrow pool fronting the main façade of your home can give the impression of a romantic moat. If you build your new pool as part of a new home construction you could create an indoor/outdoor pool by setting the pool at the corner of the house and building part of the pool beneath an arcade in the house’s structure. Such a configuration would be particularly beneficial for a pool built in a region of the country that experiences heat year-round. Architects jump at the chance to integrate the pool design into their ideas for your new home’s façade. An integrated design offers endless possibilities for the use of reflections of the building to heighten its visual appeal and light reflected from water can brighten a plain interior. The location and form of your pool will be dictated by the space required for buildings on the property, the contours of the land and the space available for the garden. Windy locations present problems that may require windbreaks to solve. Although a cooling breeze can be refreshing, wet skin is more sensitive to wind chill. If your property is on a hillside, you may get great views, but you are also more likely to get battered by the wind. An edgeless pool overhanging a sloping garden can be visually stunning, but will also introduce maintenance problems. Airborne particles, such as dust and sand will settle on the surface of your pool and eventually sink to the bottom. A constantly replenished surface scum will spoil the appearance of your pool and require you to skim the water frequently to regain that glamorous glisten of light playing on the surface of the water. Buildings, walls and fences provide the most efficient windbreaks and have the added benefit of giving shadows for shade in exposed locations. Although plants might seem more aesthetically pleasing, dead flowers and leaves will get blown into your pool, causing more cleaning work. Evergreen plants offer no better insurance against a stream of dead vegetation blowing into your pool — pine trees shed needles and the seeds in pine cones are equipped to spread with the wind. Those needles and seeds will end up in your pool. Combine constructed windbreaks with plants. Construction should block the wind and create windless zones where dead petals and leaves will fall directly to the ground rather than across your terrace and into your pool. The cost of maintaining a pool is high and homeowners in colder zones who do not want the expense of heating their pool have taken to “winterizing” their pool rather than running it through the cold months. A winterized pool gets little to no chemical treatments and is usually covered with plastic sheeting for the period that it is out of action. Reviving a winterized pool can be a costly and time-consuming task. Algae grows quickly in untreated water. However, use of a pool shock can turn the brownest pool into an appealing leisure facility in about a week. A pool built within sight of the house is not easy to overlook. Some homeowners keep maintaining the quality of their pool water through the winter. Even though a home may be in a climate that precludes the use of the pool during the winter months, many pool owners consider the winterizing strategy an eyesore and avoid it. The need to create a safety barrier around a pool — combined with the urge to extend the pool’s season of usability — has made outdoor pool enclosures increasingly popular. Running the pool pump and filling the pool with chemicals just to avoid spoiling the view is a frustrating expense for families paying for a pool that they cannot use. Pool enclosures extend the usable pool season to all year round. The pool enclosure is similar to a large conservatory built over your pool and its surrounding terraces. The structure can be locked to prevent rowdy teens or inquisitive toddlers from entering. A standard pool enclosure traps the heat, meaning you don’t have to install expensive pool water heaters to keep the pool usable in the shoulder season. The greenhouse effect within the enclosure creates an enjoyable, warm air temperature and helps heat up the water in the pool, too. There is no standard design for the swimming pools of America. As each has to be constructed individually, there are a lot of variations in the shape and size of pools. This factor makes custom pool enclosures very common. Getting a custom-built enclosure for your pool offers you infinite possibilities to create a unique feature for your home. Your pool enclosure can be attached to your home, or it could be a stand-alone, eye-catching feature of a larger garden. A pool enclosure turns a high-maintenance outdoor pool into a manageable indoor pool. However, many people enjoy the sensation of fresh air and direct sunlight while they are swimming in their pool. For those who want to enjoy their pool all year, an indoor pool is the best option. Deciding whether to have an outdoor lido or an enclosed pool can split families. Few can afford to build both an indoor pool and an outdoor swimming pool. Retractable swimming pool enclosures bring the best of both worlds. CSSI International can construct pool enclosures with removable roofs. The roof can be made to slide back in sections either through an automatic or a manually operated mechanism. This gives you year-round use of your pool, with an on-demand, open-air configuration. When you order a customized retractable enclosure from us, you have the flexibility of being involved in the design from day one while being supported by the experience of our engineers and architects. 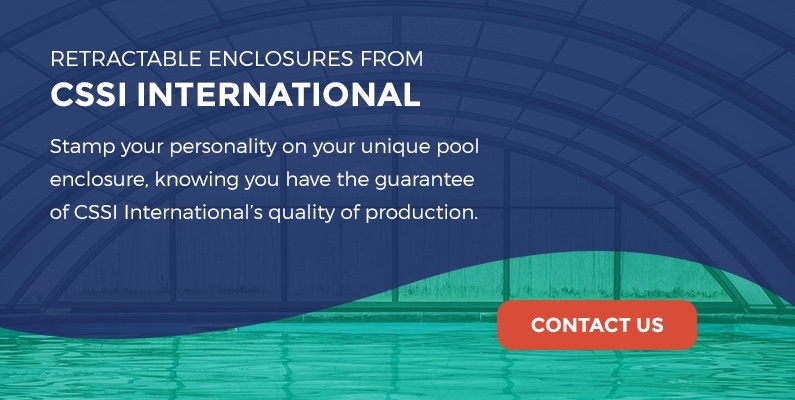 Stamp your personality on your unique pool enclosure, knowing you have the guarantee of CSSI International’s quality of production. You will be enjoying your swimming pool both indoors and outdoors for years to come. Contact us online to learn more about the advantages of inground pool enclosures. This entry was posted in blog, CCSI International, Inc. Pool Enclosures, Custom Pool Enclosures For All Environments, Residential. Bookmark the permalink.